Returning for its sixth year this November, the one of-a-kind winter experience Illumination: Tree Lights at The Morton Arboretum will awe and delight visitors with all-new experiences and returning favorites. See trees in a different light and the power of coming together to lift our spirits during the crisp, long nights of winter! 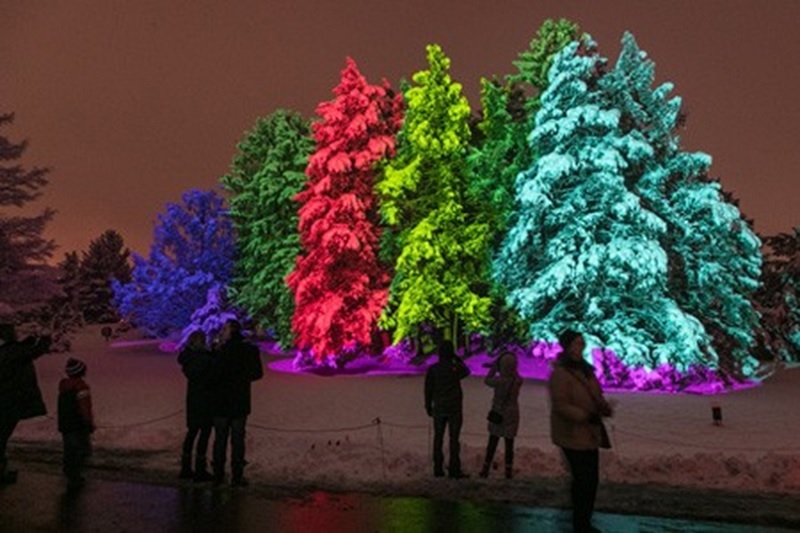 Illumination is an award-winning, one-mile outdoor walking tour on a paved path that winds through 50 acres of The Morton Arboretum’s celebrated tree collections. • Seating, warming/concession tents and fire pits available along the route. • Weekdays (Tues-Thurs) feature lower pricing & lighter crowds with a full slate of entertainment options. Illumination is an ideal way to experience the winter woods brought to life with innovative lights, projections, and music. Parking is available at the Arboretum and included in the price of admission. 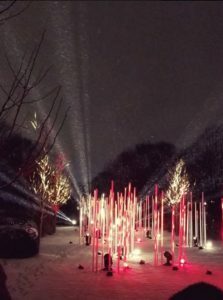 Created exclusively for The Morton Arboretum by Smithsonian-featured collaborative installation arts collective HYBYCOZO, the five sculptures in the Crown of Light experience evoke a crown of trees. Each of these giant sculptures—measuring between 9 and 12 feet tall—feature intricate, laser-cut patterns calling to mind nature, harmony and trees. Visitors can look on as vivid light from within the pieces simultaneously beams skyward and spills through the patterns that adorn its sides, creating shadows on the ground below. Created by artists Yelena Filipchuk, a native of Northbrook, IL, and Serge Beaulieu, HYBYCOZO creates large-scale installations that investigate geometry through light, shadow and perception. Their art has been featured around the world. Most of the Illumination path is accessible to people who use wheelchairs and other mobility aids. The exhibition is not accessible by car and cannot be experienced from the road.